There are two forms of cucumber beetle -- one striped and the other sporting a dozen black spots. Cucumber beetles are pests of far more plants than their name indicates. In addition to cucumbers and their relatives (squashes, gourds, and melons), these beetles are known to feed on beans, peas, corn and blossoms of several wild and cultivated plants. The spotted cucumber beetle feeds on an even wider array of cultivated plants, adding potatoes, beets, tomatoes, eggplants, and cabbage to its menu. 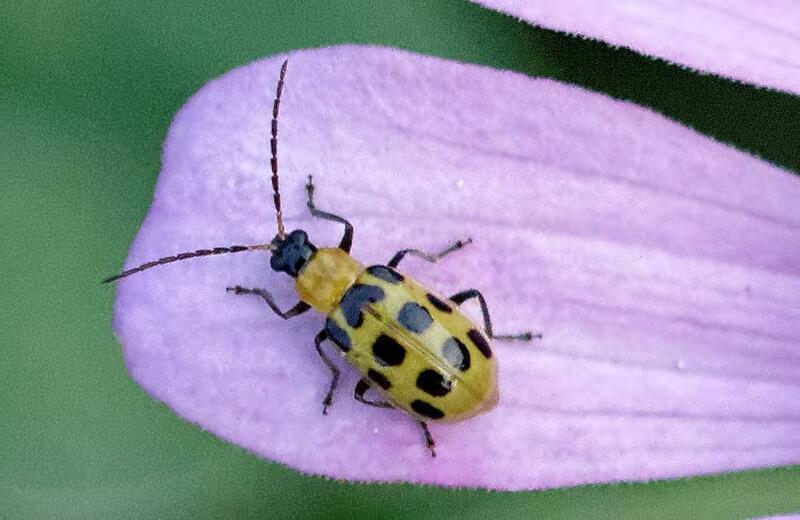 The larva of the spotted cucumber beetle is also known as the southern corn rootworm. In addition to corn roots, it infests peanuts, small grains and many wild grasses. You may find them feasting on your roses and dahlias, as well. Look for varieties of cucumbers and squash that are resistant to these pests. Cover young plants with floating row covers. Knock, shake, or hand pick beetles off plants and out of flowers, and clean up garden debris in the fall to reduce the number of overwintering adults. Dust plants and flowers with insecticides containing pyrethrum.